Birth takes a woman’s deepest fears about herself and show her that she is stronger than them. 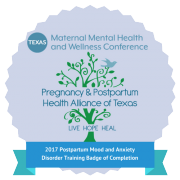 My specialized training includes Postpartum Support International and 2020 Mom’s Maternal Mental Health Certificate Online Training for Mental Health and Clinical Professionals, and Pregnancy and Postpartum Health Alliance of Texas’s Postpartum Mood and Anxiety Disorder training. Additionally, I am Circle of Security Parent Educator.